Certainty about your candidates’ employment history is important! Since the start of the recession, the increase in red flags associated with embellished resumés has been dramatic. Employment Verifications are an inexpensive way we can help you to Know Who You’re Hiring. Employment Verifications collect factual information about your candidate’s work history directly from Human Resources and Payroll. We compare your candidate’s employment claims with what was documented in their personnel file and alert you of discrepancies. Unbiased information directly from Payroll or Human Resources. Identification of gaps in a resumé or job application. Comparison with information obtained through reference interviews. Online, real-time results within 2 to 3 business days. We act as an extension of your HR Department so you can dedicate time to other important issues. Our proprietary database of employment verification policies reduces turnaround time as we know who to contact, how to contact them and when to expect results. 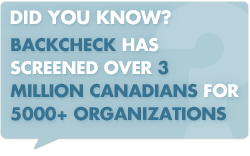 Every day, clients rely on BackCheck to obtain fast, accurate results and deliver them as soon as they are available. Employment Verifications are relatively inexpensive and offer a great deal of investigative value as the results can be cross-referenced with reference checks. Cross-Referencing with Reference Interviews yields more red flags!